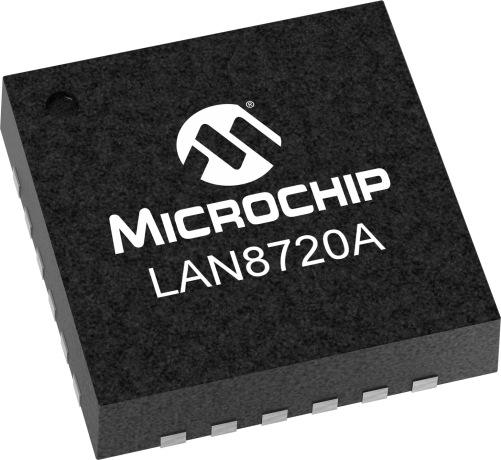 Microchip's LAN8720A/LAN8720Ai are high-performance, small-footprint, low-power 10BASE-T/100BASE-TX transceivers specifically designed for today's consumer electronics, industrial and enterprise applications. The LAN8720A/LAN8720Ai are the industry's smallest footprint solutions with up to 40% lower power consumption than existing Microchip transceivers. The LAN8720A/LAN8720Ai have an integrated voltage regulator and ESD protection components to help reduce Bill of Material (BOM) costs. The LAN8720A/LAN8720Ai connect via an RMII interface. These devices support HP Auto-MDIX†, employ Microchip's proprietary flexPWR technology and are available in both extended commercial (0° to 85°C) and industrial (-40° to 85°C) temperature range options. The EVB8720 is a PHY Evaluation Board EVB that interfaces a MAC controller to the LAN8720 Ethernet PHY via a standard 40-pin MII connector adapted for use in RMII configurations. The LAN8720 is connected to an RJ-45/Integrated Magnetics Ethernet Jack for 10/100 connectivity.